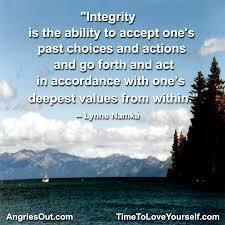 Living with integrity, isn’t this the task that we are here in this life experience to achieve? Finding our way through all of the muck to the finish line, living our life in the quality of being honest and having strong moral principles. Not everyone might view integrity in the same way, to each his own, but there are guidelines and they are very important indeed. Honesty, good character, ethics, morals, truthfulness, fairness, sincerity, these are to name a few of what it means to be sound and solid in our human skin when integrity is considered in high regard. My interpretation of integrity is this; when your spirit, your mind, your speech, your behaviours and your actions are all one, you have very well mastered how to be a good person, not only for yourself, but for the good of the whole as well. Integrity, one small word with such a powerful meaning. The manner in which we are to truly connect to our Soul rests on this one highly influential word. As I write these sentiments, I can feel the energy in my hands heat up, integrity means a lot to me. There are many of us who are engaged in our spiritual awakening, this is the path we have been trekking with all of it’s challenges and obstacles, because we know there is more to this life than mere external attachments. Those of us that have emotionally toiled through breaking down our conditioned behaviours, will know what it is like to begin to experience the state of being whole, with integrity. Goodness of character must be earned, to stand in ones truth is often a lifetimes work, there are no shortcuts or quick to the finish line paths to take. The work to finding, living and embracing a virtuous life, you must first begin by taking responsibility for your Ego, only then will you be able to master the condition of your behaviours. The patterns of your mind must be challenged, if you are brave enough, you will enter the ring of fire. It is important to remember even the most raging fire can be extinguished with the proper tools. Our turbulent and tempestuous Ego can just as well be tamed, we have all of the tools we need, everything that is required to put out the flames of our wild and stormy thinking mind is inside of us. Integrity, the power of it’s meaning has a grand quality about it, work hard to master the greatness of what this word means to you, this is your life’s purpose and is meant to be your conviction.